Picture - A JMSDF SH-60J Seahawk helicopter from JS Haruna (DDH 141) lands onboard USS Russell (DDG 59) in 2007. The Mitsubishi H-60 series is twin-turboshaft engine helicopter based on the Sikorsky S-70 helicopter family for use by the Japan Self-Defense Force (JSDF). The SH-60J/K are anti-submarine patrol version for the Japan Maritime Self-Defense Force (JMSDF). The UH-60J is a search and rescue version for the Japan Air Self-Defense Force (JASDF) and JMSDF. The UH-60JA is a utility version for the Japan Ground Self-Defense Force (JGSDF). The JMSDF chose SH-60B Seahawk as the successor of the Mitsubishi HSS-2A/B Sea King. The Japan Defense Agency acquired a S-70B-2 from Sikorsky for study in 1985. The Defense Agency was going to develop LAMPS Mk III for Japan, but it was declined by the United States, and most avionics sets were developed in the Technical Research and Development Institute. The Defense Agency ordered two XSH-60Js from Sikorsky for $27 million. Their first flights were on 31 August and in October 1987. The Defense Agency designated the model SH-60J. They were fitted with Japanese avionics systems and tested by the JMSDF. The SH-60J is built in Japan under license from Sikorsky. It began deliveries in August 1991 and entered service thereafter. Based on a concept of the JMSDF, HQS-103 Dipping Sonar, HPS-104 Search Radar, and HLR-108 ESM System equipment of the avionics of SH-60B be different. The engine is the GE/IHI T700-IHI-701C turboshaft, which Ishikawajima-Harima Heavy Industries produced under license. It is a hybrid of SH-60B and SH-60F, except for avionics. The crew includes a pilot, copilot and sensor operator. The copilot can concentrate on the role of Tactical Coordinator with the help of the Automatic Flight Management System and Inertial Navigation system. Over 100 SH-60Js have been produced by 2007. Picture - Flying JMSDF SH-60K heading to Iruma Air Base. The SH-60K is an upgraded version of the SH-60J. The SH-60K anti-submarine helicopter which strengthened performance and versatility for the JMSDF. Mitsubishi began development in 1997. The SH-60K has formerly known as SH-60Kai. The Director General of the Defense Agency admitted adoption in March 2005. Mitsubishi developed new main rotor blade, Ship Landing Assist System, new avionics system, and other systems. Two prototypes SH-60Ks were built by modifying SH-60Js. These prototypes were completed and delivered by June 2002. The SH-60K's cabin was expanded in length by 30 cm (11.8 in) and in height by 15 cm (5.91 in) compared to the SH-60J. The larger cabin allows for the new avionics system. Those and the airframe changes are compensated by the exchange of the T700-IHI-401C2 engine. 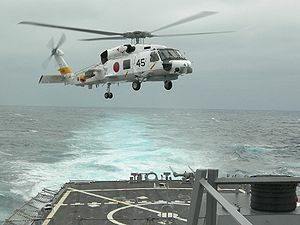 The first production SH-60K was delivered to JMSDF on 10 August 2005. A total of 50 SH-60Ks are being supplied under new production. In 1988, the Japan Air Self-Defense Force choose the UH-60L to replace its KV-107 and Sikorsky S-62 helicopters. The first aircraft was built by Sikorsky, with the company designation S-70A-12, and two more were assembled by Mitsubishi Heavy Industries. Mitsubishi is producing the remaining UH-60Js under license. 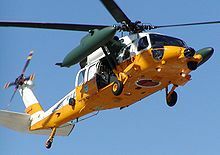 The Japan Marine Self-Defense Force also chose Search and rescue, and utility helicopters to replace the S-61A in 1989. The UH-60J is powered by T700 engines license-built by Ishikawajima-Harima Heavy Industries in Japan. It features external fuel tanks, an external rescue winch, a Japan-built radar, a FLIR turret in the nose and bubble side windows for observers. The Japan Air Self-Defense Force machines were fitted with T700-IHI-701A engines, while Japan Marine Self-Defense Force machines were fitted with marinized T700-IHI-401C engines. Fuel tanks can be attached to pylons on stub wings. The UH-60Js began deliveries in 1991 and entered service in 1992. A total of 40 UH-60Js were in service in 2010. The JASDF ordered 40 newer UH-60Js in December 2010 to begin replacing older UH-60Js. Mitsubishi and Sikorsky have teamed in support of the Self Defense Force's mission requirements. The UH-60J+ incorporates various upgrades for the modern SAR mission. By 2006 Defense budget of Japan, UH-60Js begin addition of Refueling probe in 2009. These UH-60Js completed training with the United States Air Force and widened their activity in SAR mission. The Japan Ground Self-Defense Force ordered utiliy verstion of the UH-60L designated UH-60JA in 1995. The JGSDF began receiving the UH-60JA in 1997. It features improved avionics, including FLIR, Color weather radar, GPS receiver, a Night Vision Goggle compatible cockpit and the wire cutter, as options. The JGSDF plans to acquire 70. The JGSDF was plan to replace UH-1H helicopter which became obsolete. It was decided to replace them by High-Low mix concept by UH-60JA and UH-1J which updated UH-1H, the UH-60JA being the high and the UH-1J the low. The JGSDF which took the limit of the budget in 2004 considers Rotorcraft acquisitions of multi-years and re-evaluating the helicopter acquisition of the plan. There is one option under the review. Except UH-1J or UH-60JA, acquire just one utility helicopter type, but was examining in the announcement. Picture - A JMSDF SH-60J in Okadama Airport, with a JASDF UH-60J behind it. S-70B-2: Version purchased from Sikorsky for research by the Defense Agency. XSH-60J: Prototype for SH-60J. 2 XSH-60Js were exported by Sikorsky. SH-60J: Seahawk version for the Japan Maritime Self-Defense Force produced by Mitsubishi under licence. UH-60J: Rescue helicopter license produced by Mitsubishi for the Japan Air Self-Defense Force and the Japan Maritime Self-Defense Force. UH-60JA: Utility version for the Japan Ground Self-Defense Force based on the UH-60J. USH-60K: Among Two prototypes, One was redesignated as evaluation type. SH-60K: Improved version of SH-60J. Trial manufacture finished in 2001, and deliveries began in August 2005. 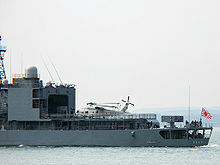 Picture - A JMSDF SH-60 parked on the deck of an Asagiri class destroyer DD.158 Umigiri departing from Portsmouth Naval Base, UK, on 28 July 2008. Japan Air Self-Defense Force has 31 UH-60Js in operation as of Nov. 2008. Akita Air Rescue Wing : UH-60Js Search and rescue wing. Japan Ground Self-Defense Force has 27 UH-60J/JAs in use as of Nov. 2008. No. 101 Squadron (Camp Naha): UH-60JAs Search and rescue squadron. No. 102 Squadron (Camp Kisarazu): UH-60JAs Subsidiary Air assault unit. Japan Maritime Self-Defense Force has 102 SH-60J/Ks and 19 UH-60Js in service as of Nov. 2008. No. 21 Squadron (Tateyama Air Base): Fleet Air Force having SH-60J and SH-60K. No. 22 Squadron (Ōmura Air Base): Fleet Air Force. No. 51 Squadron (Naval Air Facility Atsugi): Operational Evaluation Unit. No. 72 Squadron (Tateyama Air Base, Ominato Naval Base and Iwojima Air Base): UH-60Js Search and rescue squadron. Bishop, Chris. Sikorsky UH-60 Black Hawk, Osprey Publishing, 2008. ISBN 978-1-84176-852-6.